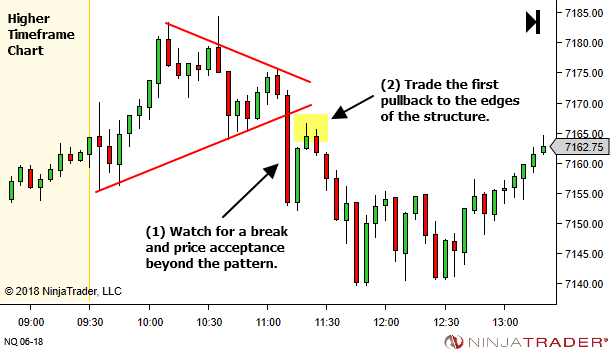 Last week we looked at the following chart sequence showing an obvious symmetrical triangle pattern within my higher timeframe chart. I don't know if I was somehow influenced by that article. 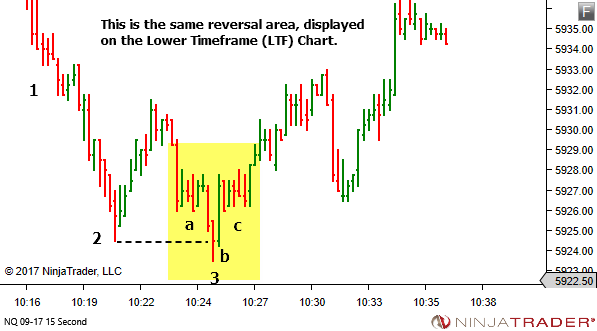 I don't usually look for patterns on the higher timeframe chart. It's primary purpose is for establishing an S/R framework. As I said last week… sometimes they just stand out as so obvious that you can't miss them. 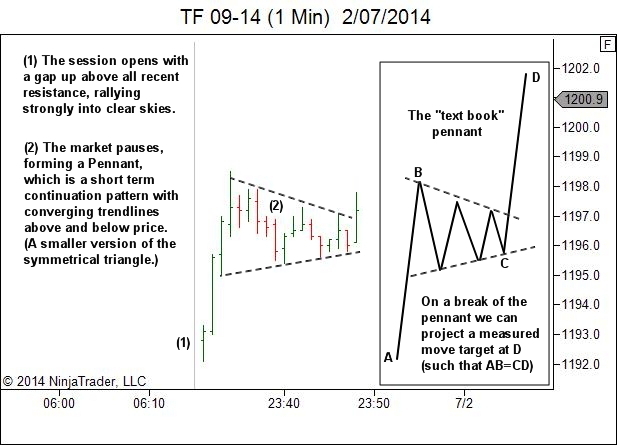 So I watch them for potential trade opportunity around the edges of the pattern structure. 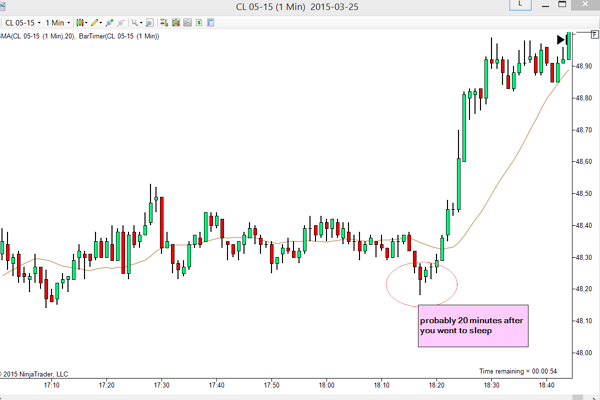 Usually for two alternatives – a breakout failure or a breakout pullback. So let's do one more example. A little different this time in that the breakout extends much further before commencing the pullback. 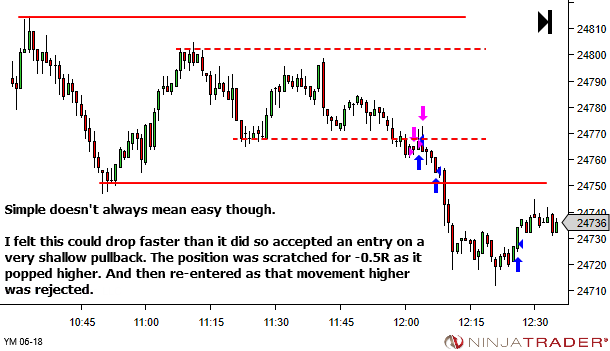 The same concept applies though – take the first pullback against the edges of the structure. 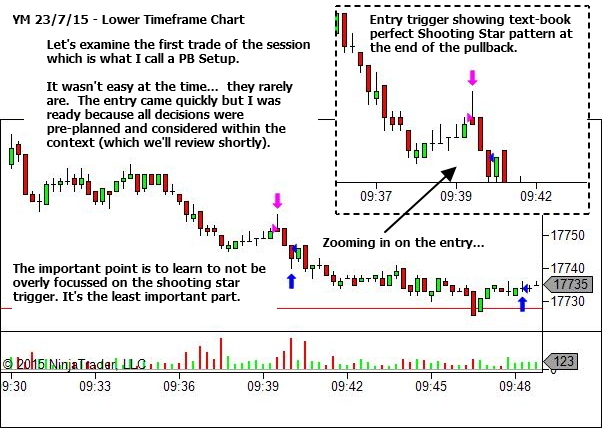 Zooming in now to the Trading Timeframe chart at the time of entry. (b) Trade BPB / BOF around the edges of the structure. 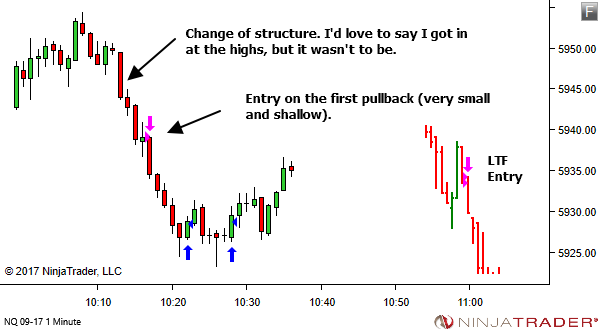 It's not how I typically trade, but I expect a whole strategy could be based around the idea. I don't actively seek to find patterns on my higher timeframe. But sometimes they just stand out as so obvious that you can't miss them. 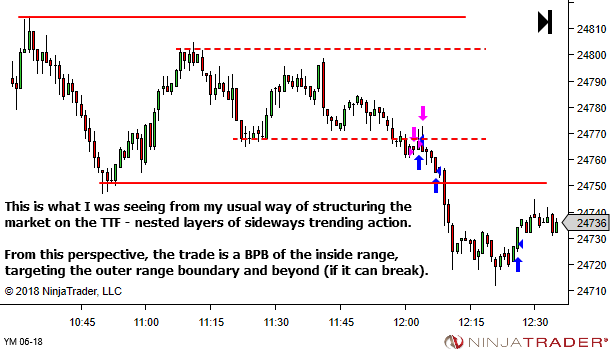 So I watch them for potential trade opportunity around the edges of the pattern structure. 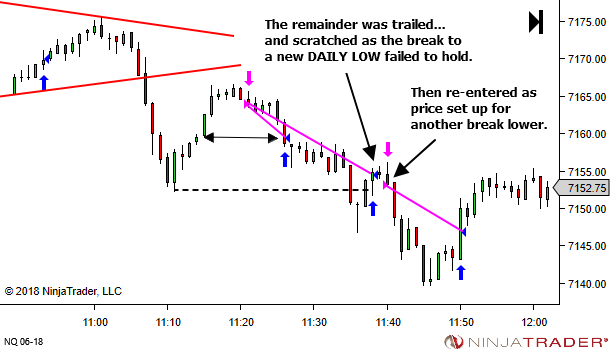 Usually for two alternatives – a breakout failure or a breakout pullback. 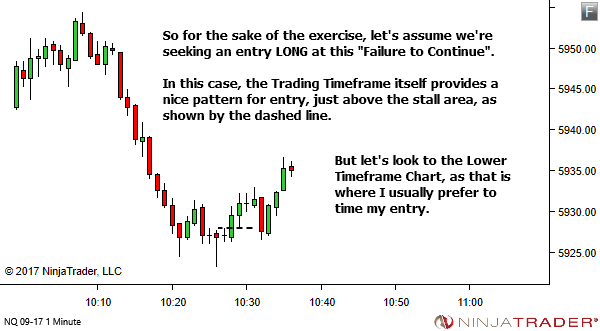 Of course, in either case the trade idea must make sense from my usual trading timeframe analysis. And also make sense in accordance with my philosophy on price movement and where & how it creates opportunity. Keep an eye out for them. They can provide good opportunity. 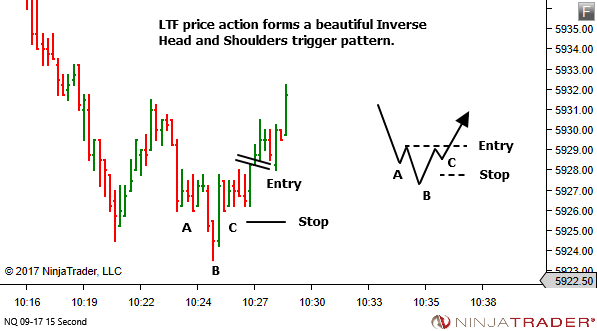 Lower timeframe (LTF) entry patterns can also trigger exit. Perhaps that's obvious? Perhaps not? 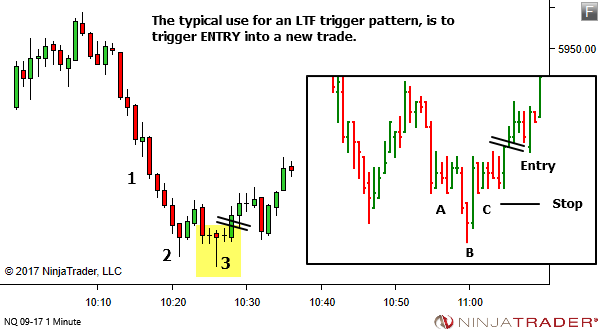 In any case, as I used an LTF trigger pattern for exit during the week the following thought crossed my mind – "I don't recall discussing this via the newsletter"
There are MANY entry trigger patterns. 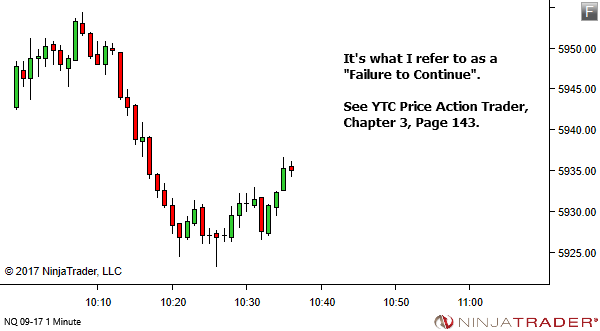 For those with the YTC Price Action Trader, refer to Chapter 4, pages 87-90 for a diagram summary of all the patterns I watch out for. 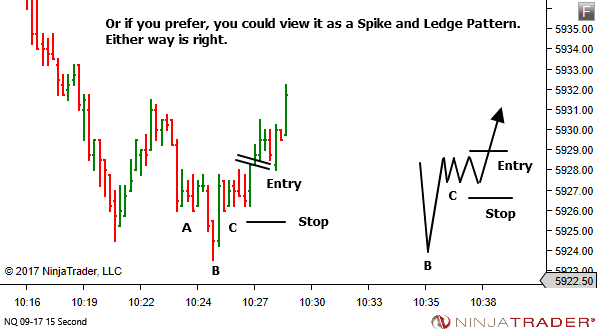 By far the majority of discussion with lower timeframe patterns is always with respect to entry. So let's start with an entry example. 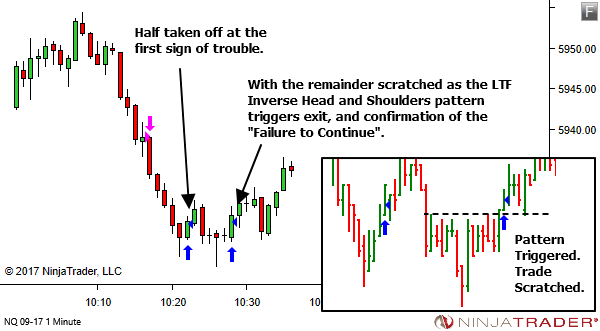 The exact same trigger pattern can also be used to trigger EXIT from an earlier (opposite direction) trade. Let's assume now that we were SHORT much earlier, trading down into the lows. Please review these articles if you haven’t read them already, in order to understand the following Q&A. 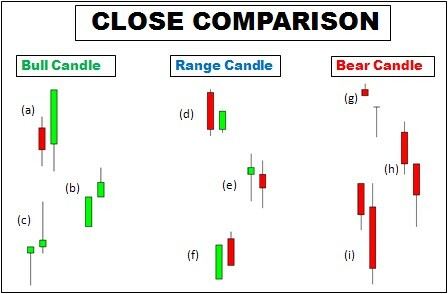 In part two you’re explaining candlestick close positions and comparisons to determine sentiment. Are d and f patterns correct? High close is more bearish than a low close? I can’t understand that unless you’re taking prior candle sentiment into it somehow. Yes the description of sentiment is correct. Remember, at this stage of the analysis process we’re simply observing two consecutive candles. We have yet to take the bigger picture context into consideration. So the final assessment of market sentiment could well be very different. But let’s examine each of the two pictures (d) and (f). Let’s number the candles 1 and 2. Considering candle 2 only (as a single candle), we see it is a high close candle, implying bullish sentiment. However, let’s now take the previous candle into account, to get a feel for the sentiment over the last two candles. The previous candle (candle 1) was a low close candle with large range, (ie bearish) and the current candle was only able to retrace approximately 50% of the previous bearish range. Overall… strong bearish (candle 1) followed by weaker bullish (candle 2) combines to equal a weak-bearish sentiment (or probably more correctly the bearish side of neutral). Now… subsequent candles may change that assessment. The price could continue higher through a high close bull candle that breaks above all previous highs. But we don’t know that. We simply are looking at the current two-candle pattern sentiment, in this case weak-bearish. And then we go on to consider the meaning of that within the wider context of the current and previous price swings, and our S/R framework. A single candle comprising the time period covered by both candles 1 and 2, would have a red body covering the upper half of the range, with a lower tail. Still bearish, but weak-bearish. This works in exactly the same way. By itself, candle 2 is bearish, but when considered as a two-candle pattern, we have a strong bullish candle, followed by a weaker bearish candle. Overall sentiment is weak-bullish (when considering this as a two-candle pattern). The candle addition process would show a single green candle, with body covering the lower half, and an upper tail comprising approximately half. It’s still bullish in sentiment, but once again weak due to the rejection of higher prices. Subsequent candles may amend this… but for now it’s weak-bullish. Is this clear? If not, please let me know and I’ll try to explain in another way. In the end though, it all comes down to context. 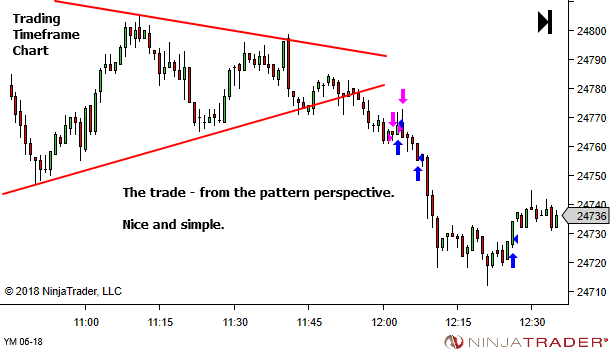 Where the patterns are occurring within the market is a great deal more important than the patterns themselves. Ok, thanks lance. You’ve explained that well and I get it. But… it does seem like fine lines. Candle 2 in (d) wouldn’t have to close much higher before the single candle addition starts to look like a hammer, usually a fairly bullish sign! You’re right – it can be a very fine line. But remember, we’re just talking about a VERY small part of the picture here. It’s just a quick assessment of the sentiment shown by the latest two candles. More important is the current bias we have as a result of the bigger picture (context) – the positioning of price with respect to our S/R framework, the direction of the trend, and the nature of the trend movement (slowing down, speeding up, neutral). 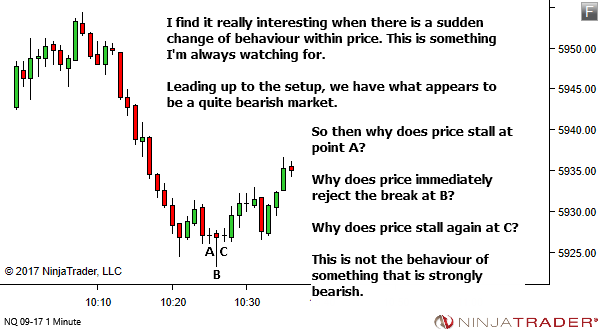 In analysing a two-candle pattern in isolation, it’s easy to forget that in reality (while trading) this analysis is occurring within the context of the bigger picture bias. So the difference between a neutral (perhaps slightly bearish) pattern such as shown by (d) and a neutral (but potentially bullish) pattern such as would have occurred if the second candle closed higher forming a shooting star (or hammer)… is perhaps negligible. Example: bearish bias; downtrend which has moved into an area of support. 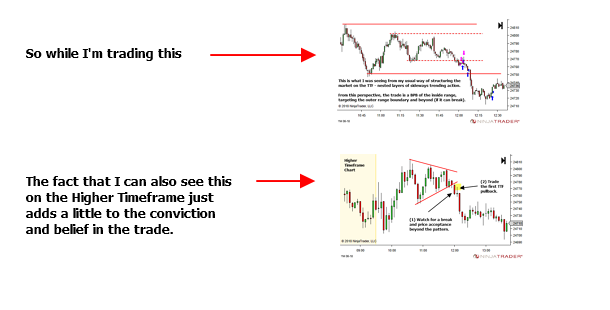 Both patterns (d) or the more bullish variation, indicate a presence of buying. Not yet enough to break the previous high. But they show a good sign of buying, so confirm the potential for support to hold. We wait for more information, and look for a place to buy. Example: Uptrend, currently in a normal pullback, pattern occurring after 3 down candles, with price resting on the previous swing high. 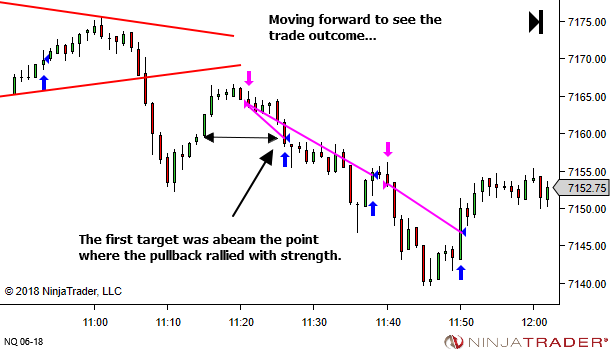 Both patterns are (again) evidence of buying, and possible signs that the pullback has come to an end. 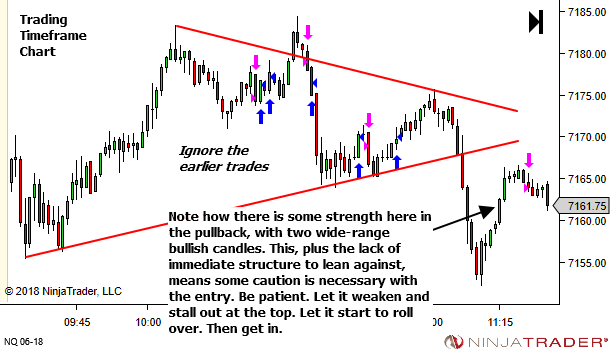 Look for an entry long for continuation of the trend. 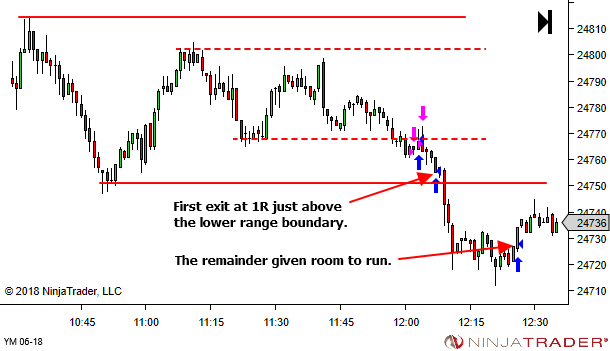 Example: Downtrend, not at S/R. Green candle shows potential start of countertrend pullback. This is a sign to watch for strength / weakness of the pullback, remaining alert for an entry short on failure of the pullback. 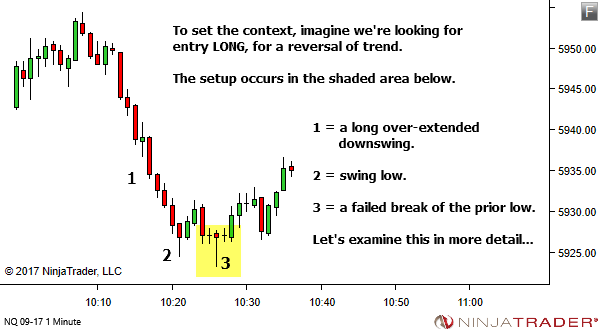 The same pattern can indicate potential opportunities long or short, depending on the context of where they’re occurring within the market. Don’t get too caught up in the ‘two candle pattern’ sentiment. It’s a quick assessment, which is then used as confirmation or non-confirmation of your larger market bias. That’s all it is. 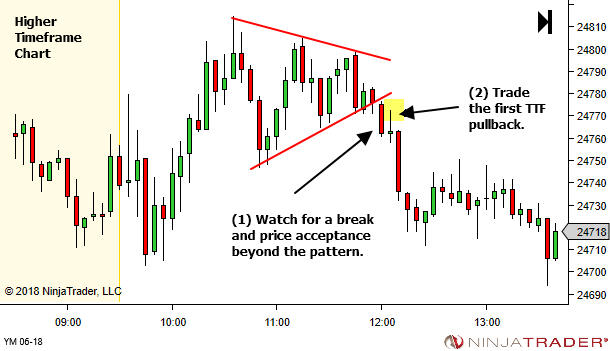 Now that we’ve completed the whole Price Bar Reversal Patterns Video series, I thought it might help if they were all on one page. It saves you jumping from page to page after every video.